Let these prayers demonstrate the link between the God that set us free and the Nation that preserves and extends that freedom. -All periods of American History are represented from Native Americans to the First Colonists, The Founding Fathers, Civil War Soldiers, Second World War Soldiers to Contemporary Prayers relating to recent events such as 911. -More than! 60 Prayers not including the Morning and Evening Prayers from the Book of Common Prayer first used in the colonies. -"On Prayer" a section devoted to famous quotes about prayer, Lesson 28 from the Baltimore Catechism of 1891 "On Prayer" and the definition of prayer .-Illustrations of Authors and Places mentioned.-152 Pages. Review from the Catholic Review Newspaper April 22, 2004 issue. While the ragged and dispirited American troops were quartered for the winter in extreme conditions at Valley Forge in 1777, a pious Quaker by the name of Potts was walking through a large grove near the army’s headquarters when he was surprised by the sight of a man, his back toward him, kneeling in earnest prayer. Potts stood still and watched as the man slowly got to his feet and then turned to face the Quaker, who recognized him immediately. It was Gen. George Washington. When Potts got back to his home he excitedly told his wife he was now convinced the Americans, even though they had not fared well at Germantown, would go on to beat the British because he had witnessed Washington in prayer. The anecdote, intended to establish the Christian character of Washington, is retold in the introduction of a slender volume called “Prayers from American History,” compiled and edited by Conrad Bladey, a parishioner of St. Philip Neri in Linthicum (near his home), who was inspired to create the unique work after attending a faculty retreat for Seton Keough High School where earlier this year he had taught American history. The retreat addressed the concept of the school as a “community of prayer,” and whether it was, in fact, a good idea to open each class with prayer. Conrad, who now teaches Irish studies at Harford Community College in the evenings, told me he was a little surprised to discover how many teachers weren’t too keen on the idea, noting as they did that prayers were already broadcast on the school’s intercom system at the beginning and end of the school day. Prayers before each class would detract from the need to press on with the curriculum, they argued. Conrad said he understood their concern because classroom work is indeed demanding, but it got him to thinking. Surely, he thought, there were prayers that were part of U.S. history, for example, which would actually contribute to not detract from the curriculum. He couldn’t find anything already in print and so he spent hours at local university libraries and the Library of Congress tracking down prayers from American history, and the result is his booklet containing prayers from just about every period of our history, from the time of the American Indians to 9/11. And a fascinating collection it is. In it you’ll find Mark Twain, wonderful entries from Washington’s prayer journal, the prayer on “the day of fasting and prayer” ordered by Abraham Lincoln; the prayers of Thomas Jefferson and John Quincy Adams; prayers of soldiers in the Civil War, including those distributed to Jewish Confederate soldiers; prayers of Joseph Smith, founder of the Mormons; early African American prayers; the prayers of poets like Whittier and Sandburg, and of evangelist, Billy Graham. I don’t suppose Conrad brought that up at the Seton Keough faculty retreat. 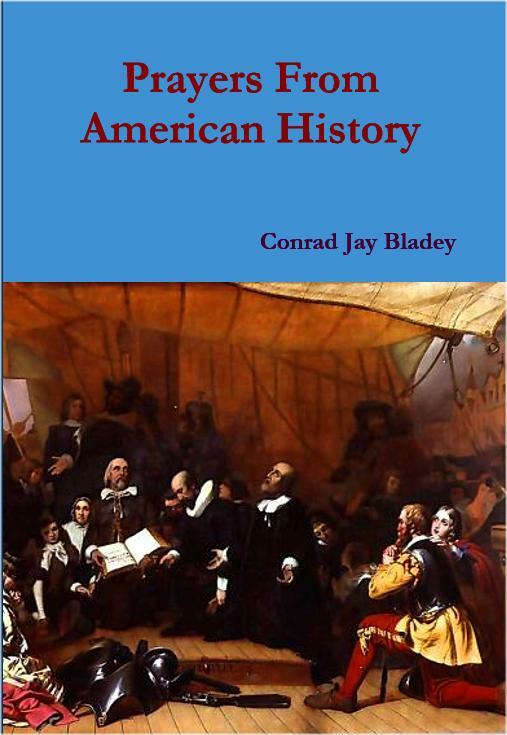 Conrad is selling his “Prayers from American History” for $9, which he says is his cost, and one that schoolteachers and other interested folk may easily afford.